Infratech Heaters: Yes, You Can Heat the Great Outdoors! How do Infratech Heaters Work? Are Infratech Patio Heaters Any Good? Are Infratech Patio Heaters Safe? Which One is Right for My Outdoor Space? When you think about an outdoor space heater, plenty of thoughts probably come to mind. The most prominent of these might be childhood memories of mom or dad expressing displeasure over you leaving the door open on cold days. Heating the great outdoors may seem like an exercise in futility, but some deck heaters are actually meant for just that purpose, and they can be especially useful if you have an outdoor spa area or entertaining space. This is where Infratech heaters come into play. For as long as our planet has been in existence, our sun has provided light; by extension, this light happens to also be our oldest and most efficient source of heat. Though the sun’s heat may not be quite so evident in the throes of winter when it’s 8 degrees with a bitter breeze biting into our skin, it’s still there, keeping our planet alive. It always promises to return once Earth’s axis tilts back in our favor. While the sun is our most widespread and enduring source of heat, it has certainly had a number of reinforcements crop up over the centuries. First off, mankind discovered fire, and it did its part to supplement the sun’s effectiveness during darker and colder times. We eventually tapped into our planet’s reserves of coal and natural gas; of course, both seem to be running a bit low these days. Electricity took hold, and it brought on an unprecedented level of technological advancements in this particular realm. At this point in time, we’re rapidly trending back toward utilizing the sun’s energy to reduce our effect on the future and generate greater efficiency and sustainability. Somewhere in the midst of all this, infrared heaters were invented. Inspired by the sun in a sense, these sources of heat operate in much the same manner as our nearest star. Infratech emerged some 50 years ago; since then, the company has found its way to the leading edge of the infrared industry. Using a quartz element for radiant heating, outside heat lamps incorporating infrared technology emit light on a very specific wavelength. We can’t see this light flowing from its source, but we can feel the heat it produces. The light doesn’t heat the air like traditional heaters do; rather, it’s absorbed by solid objects in its path, thereby raising their temperature to a more comfortable level. Outdoor deck heaters like these don’t heat surrounding air, so their effects can’t be whisked away by a chilly breeze. Since they heat up people and furniture rather than the empty space around them, they’re highly effective regardless of the outdoor air temperature. Because virtually no energy is lost during the heat generation process, infrared heaters are among the most effective options on the market. Based on sheer standard operating procedure alone, infrared heaters are a logical choice for outdoor use. High efficiency makes them a cost-effective alternative to other sources of heat, especially when it comes to the level of demand placed on patio heat lamps; after all, you’re heating the outdoors. Electric outdoor heaters like these give you greater than 90 percent heater efficiency as do their propane and natural gas counterparts. 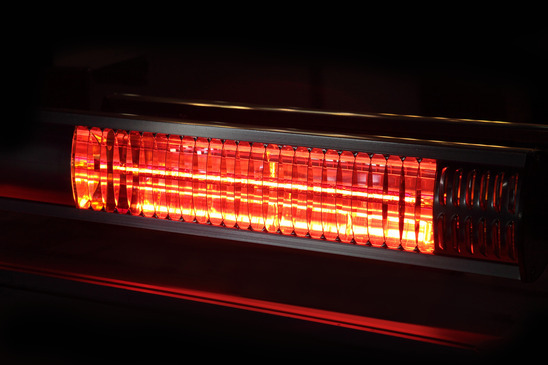 In regard to Infratech patio heaters specifically, the company has dedicated itself to remaining on top of the latest manufacturing techniques. They’re also committed to providing unparalleled quality and creating environmentally-friendly heating options for residential, commercial and industrial applications alike. On a separate note, this industry leader promises to maintain its competitive edge where pricing is concerned, as well. Current owners of Infratech heaters aren’t hesitating to give their outside heat lamps a five-star rating. Infrared heaters are sometimes likened to the sun in the way they produce warmth. You’re probably well aware of the potential harm stemming from exposure to the sun’s UVA and UVB rays, but you won’t get that from an Infratech heater. The type of technology they use is widely referred to as ‘radiant heating’, which can lead consumers to erroneously think they are getting exposure to UV radiation, as you would from the sun. Bear in mind, the term “radiant” as it’s used in this scenario doesn’t infer radiation in quite the same manner as its more dangerous connotation. It simply means heat is given off, emitted, distributed, etc. If you choose infrared outdoor space heaters, there’s no need to slather on sunscreen for protection. Though infrared heaters are perfect sources of heat for your patio, they’re also suitable for use inside your home or business. They give off no harmful emissions or cloying odors, so they’re completely safe in areas with little to no ventilation. That’s not the case with many conventional heaters. Even your average fireplace needs a chimney and well-maintained flue to keep from smoking you out of your house. Unlike certain other types of outdoor space heaters, infrared models aren’t significant fire hazards, either. Most are equipped with automatic emergency shut-offs in the event the unit overheats, and tip-detection technology has been thrown into the mix in the event they’re knocked over. Cool-touch exteriors have also been put into play, so they’re not likely to burn children or pets who might happen to come in contact with them. A number of different styles and brands of patio heaters for sale present themselves for your consideration. You’ll find natural gas, propane and electric models acting as standalone heaters as well as wall or ceiling-mounted units. Some are even designed to be affixed under your patio umbrellas. Natural gas infrared heaters are said to offer the lowest cost of operation, but they’re not exactly portable. They have to stay where the fuel line deems necessary. If you don’t have an outdoor natural gas supply, you’ll need to have one professionally installed; if one’s already available, you’ll still need to hire a professional plumber to connect your outside heat lamps. Propane deck heaters are the most mobile because they take their fuel supplies with them. The drawback here would be the added cost of purchasing tanks and the time and effort entailed in changing out those tanks when one runs dry. If you don’t have a natural gas line or an electrical outlet on your deck or patio, though, this could be the most appropriate choice for you. Electric outdoor heaters could be considered a middle-of-the-road option. Their cost of operation is a bit higher than that of natural gas, but it’s a steady fuel supply you won’t have to continually replace or refill. While they do need an electrical outlet, they’re not necessarily restricted to a fixed location. A heavy-duty extension cord readily available at your local hardware store gives you a relatively inexpensive widening of their portability parameters. A few electric outdoor heaters designed and manufactured by Infratech stand out in the crowd of patio heaters for sale. Each has its own key features to contemplate. All bring you the warm, cozy feeling that comes with infrared technology. A member of Infratech’s Slim Line Series, this model is designed with a low profile, so it essentially blends in with its surroundings. It can be mounted underneath the roof of your deck, on your pergola or on the wall in the event your outdoor space lacks coverage. Despite being the least powerful Infratech heaters unit on this list at 3,000 watts, this patio heat lamp effectively generates warmth from heights of up to 11 feet. It requires a 240 volt outlet, but if you’re operating on a 120 version, you may be able to find an adapter to bridge the gap. Mounting options remain versatile with this more powerful model in the infratech heaters range. While its profile is slightly more pronounced than the previous option, this patio heater still offers flexibility where installation is concerned. An optional flush mounting frame is available if you’d like a more recessed look. Again, you’ll need a 240 volt electrical outlet or some type of comparable alternative setup for this unit, and you can position it at heights of 7 to 11 feet. Still operating on 240 volts, this Infratech heaters model takes us into the dual element range. The manufacturer notes this electric outdoor heater is best suited for loftier installation needs of up to 14 feet as well as areas with higher square footage. Like its lower-wattage counterparts, it’s silent but effective, and it’s equally efficient. Hardwiring into your home’s electrical circuitry is recommended for this outside heat lamp, which would best be carried out by a professional electrician. All these electric infrared patio heat lamps are receiving rave reviews from current owners regarding their effectiveness, appearance and ease-of-operation. They’re also approved for both indoor and outdoor use, so they’ll fit in as nicely in your garage or enclosed sunroom as they do on your deck or patio. The 3,000 and 4,000 watt models are considerably accommodating when it comes to mounting. They come with a variety of hardware, so you can install them vertically, horizontally or technically even diagonally if need be. Unless you choose the recessed mounting option or the 6,000 watt model, you can move them around as you see fit. Exactly how many heaters you’ll need for maximum comfort on a chilly evening outdoors depends on the size of your space. Infratech advises their 3,000 watt model covers a 7 x 7 foot area. The 4,000 watt version generates enough warmth for a 10 x 10 foot space. At 6,000 watts, the most powerful Infratech heaters model mentioned here heats 11 x 11 feet; keep in mind, it’s built to be mounted higher, so this makes a bit of a difference. Infrared heaters have been deemed the most efficient and effective on the market in terms of outdoor heating needs. Electric models are top-of-the-line in this regard, and Infratech heaters are a leader in this field. These specific models may not be as flexible in their positioning options as propane models, but they require less energy to keep them going from both a personal and fuel-based point of view. Incidentally, the 4,000 watt patio heat lamps made by Infratech are the least expensive in this rundown, and they cover only a slightly smaller area than the mammoth model. If you can get away with mounting your outdoor space heater at eight to 10 feet regardless of a higher ceiling, this may be the best way to go. In all likelihood, you weren’t raised in a barn, but either of these models gives you the power to effectively heat the outdoors. In summary, we think Infratech heaters are a very good option to consider. This entry was posted in Patio Heaters on by Luke.